Korthi and Korthi Bay, or Gialos, is located in the southern part of Andros, between the high mountains of Gerakonas and Rachi. The settlement is flanked uniquely by the view of the surrounding villages. On the slopes of Raches is the beautiful picturesque villages: Aidonia, Korthi, Ammonakliou, Moussionas and Piso Meria. The area dominates the castle of Faneromeni. For swimming, you can go to the long beach (Milos), the sheltered harbour of St. Cathrin and behind the hill, the famous beach of “Gria to Pidima”. The Castle of Faneromeni was the largest medieval city of Andros. 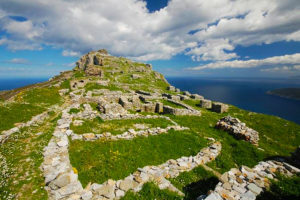 It is located to the north near Orthos Korthi at an altitude of 600 meters. On the fifteenth of August, the church of Faneromeni is celebrating, and feasts are held. The Monastery of Tromarchiani is a beautiful, well-preserved monastery near Steno, which operated until the middle of the previous century. Built on a steep slope, it offers an unforgettable view of the southwest side of the island. In its church, you will admire the wood-carved iconostasis and the carved marble inscriptions. The more extensive area is full of churches and monasteries. You will find the Alinou Monastery above Aidonia, the Ftetron Monastery high up in the mountainous region of Rachi and Agia Moni near the sea. In Vouni, the tiny monastery of St. Antonios. 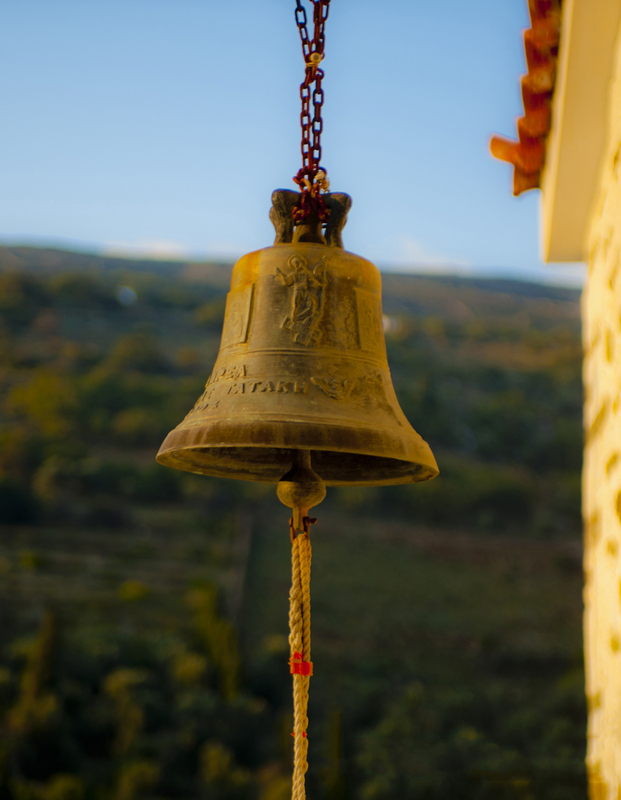 The Holy Trinity in Korthi, where the first pre-revolutionary school in Andros was founded, has rich heirlooms and manuscripts. St. Nicolas of Ano Korthi, which is one of the three parish churches of Ano Korthi and dates back to the second half of the 12th century. St. John Theologos located in Korthi is the oldest church on the island and was built between the 5th and 8th centuries. St. George Faralis is a small picturesque little church situated next to the road between Korthi and Gavrion after Kapparia and before the village of Zaganiari. Syneti village is built on the mountainside where the Dipotamata gorge ends. The slope ends in a ravine with a river, which “ties” with the opposite mountain, Kourvoulo. 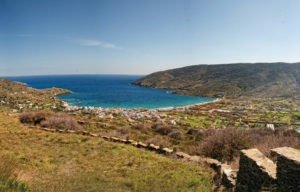 Exo & Mesa Vouni are remote villages at an altitude of 458 meters on the southern side of Gerakonas. In Mesa Vouni there is a small oak forest. The two communities produce delicious vegetables and good wine. The Monastery of Panahrantos is nearby. Kochilou is built on a slope with excellent views of the Aegean Sea, at an altitude of 400 m. It is 14 km away from Hora and 48 km from Gavrio. To the northeast of the village is the Castle of Faneromeni or Pano Kastro. Yannisseo is an agricultural settlement with spectacular views, gardens and orchards. Next to the street is the impressive large church of Agridiotissa. 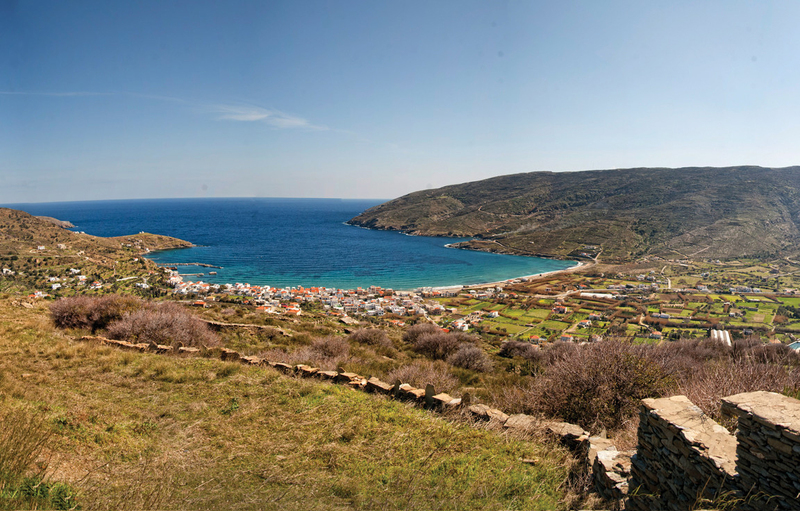 Episcopio is one of the most beautiful villages in Andros. Houses built with dark stone, elaborate pigeons in olives, figs, cypresses, pine trees. At the end of the concrete road of the village is the bridge of love. The village of Lardia is full of flower gardens, arbours, pigeons, old stone bridges and offers impressive views. Aidonia is a village with lush vegetation, with pigeons, lots of water. Visit the fountain in the ravine, the most beautiful sandwich on the island that even today women use it. Moussionas is a stone village with traditional houses. He also has an excellent source like Aidonia, called Vrisara. On the way, there is Holy Trinity, an old monastery where the first school of Andros also functioned. Piso Meria is a small hidden village with watermills, walnuts, fig trees and laurels. The captivating village of Kapparia is built on the slope of Mount Gerakonas from the top of the mountain, which leads to the valley of Korthi and reaches the sea. Zaganiari is a mountainous village built near Stavropeda above the Geometric period settlement of Zagora and near Strofilas.